Doosan is a South Korean conglomerate with 35.000 employees. It is now one of the 2.000 largest listed companies in the world. The company is active in different business sectors: energy and power generation, engine production (including heavy diesel engines for power plants and ships), construction equipment, tools, military engineering and civil / building engineering. 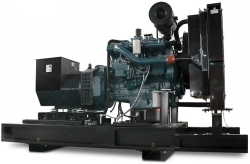 The modern Doosan diesel generator engines are reliable and durable and are distinguished by their exceptional value. Most engines meet the strict U.S. and European exhaust emissions regulations. The Doosan generators are offered as "open frame" genset or with "weather- and soundproof" enclosure. Depending on the purpose, various digital control panels as well as options for standby and parallel operation are available. For the sound-proof generator sets of MAW series extended fuel tanks in base frame (double-walled) were offered optional with a volume from 995 to 2.100 liters depending on the size of the enclosure / genset housing.